Elder Joseph B. Wirthlin addresses a recent LDS Church conference. This is an archived article that was published on sltrib.com in 2008, and information in the article may be outdated. It is provided only for personal research purposes and may not be reprinted. LDS Apostle Joseph B. Wirthlin showed up for work Monday morning at the church's downtown headquarters at his usual time -- 7 a.m. The 91-year-old worked for about an hour, then went to his Salt Lake City east-bench home. In the evening, he chatted with his son, Joseph B. Wirthlin Jr., about attending the LDS First Presidency Devotional on Sunday evening. At about 10:40 p.m., Wirthlin's daughter, who was staying with him overnight, heard her father take two deep breaths, then he was gone. The family lowered the American flag at their home to half staff and left the Christmas lights blinking. "He went on his own terms," Wirthlin's son said Tuesday, becoming emotional. "You are never ready to lose a loved one, but he was expecting a great reunion with my mother [who died in 2006] on the other side." An LDS apostle since Oct. 9, 1986, Wirthlin held one of the top leadership positions in The Church of Jesus Christ of Latter-day Saints. To the Mormon faithful, the 12 apostles and three members of the governing First Presidency are "prophets, seers and revelators." Though revered by the church's 13 million members, Wirthlin, the church's oldest apostle, was seen as the epitome of humility and self-deprecating humor. He will be remembered for his "sincere heart and ability to laugh with those around him," said Gov. Jon Huntsman Jr. "He has been a true example of service, spanning several generations and vast geography." 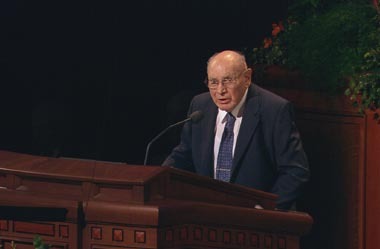 As the news of Wirthlin's passing hit Mormons on the Internet, several bloggers commented on his homey sermons on kindness and generosity. They called him "down to earth" and "a spiritual giant." "He often spoke about being aware of those who feel down or left out," Angie Whit wrote on timesandseasons.org. "He was concerned with those that struggled. I appreciated his words so much." Wirthlin's final speech at the church's Semi-Annual General Conference, "Come What May, and Love It," urged Mormons to face adversity by learning to laugh, seeking the eternal, trust in God and expect justice in the heavens. Learning to endure times of disappointment, suffering and sorrow is part of our on-the-job training," Wirthlin told millions of Mormons across the world. "These experiences, while often difficult to bear at the time, are precisely the kinds of experiences that stretch our understanding, build our character, and increase our compassion for others." The lessons of football: Back in 1936, "Speedy" Wirthlin played halfback for the University of Utah. With a slight build and medium height, he was light on his feet and an all-around good athlete. At East High School in Salt Lake City, he had played quarterback as well as competing in the 100-yard dash, low hurdles and basketball (he won the Intermountain Free Throw Contest). Wirthlin had to "run for his life," he joked with his family. But into his 70s, he could still outspring his son. In 2004, Wirthlin's love of football created an instant connection with then U. football coach, Urban Meyer. The aging apostle went to nearly every U. home game, sitting behind Meyer's wife, Shelley, who high-fived him after each touchdown. "The first time I did it, I almost knocked him down," Shelley Meyer said at the time. The love of football continued to the end of his life. Last month, he watched the U. decimate its rival Brigham Young University, an LDS Church-owned school. Was he happy with the outcome? "Absolutely," said his son. For Wirthlin, football, and sports in general, have been sermon fodder and a subtext for his life. Success in sports is, after all, a lot about discipline. His coach, Ike Armstrong, told the Mormon athlete that the game required "not only football prowess, but also courage, duty, dependability, perseverance, integrity and enthusiasm, which resulted in physical, emotional, and even spiritual conditioning at the highest level," Wirthlin said in a 1978 speech. "The end product was to be nothing less than character of the most solid." Growing into his calling: Wirthlin also learned such lessons as a young boy working in his father's wholesale meat business and grocery store. The store opened in 1917, the year of his birth, on the corner of 200 South and 800 East in Salt Lake City. During the Great Depression, he would pull his small red wagon, filled with food and clothing for the neighborhood's needy families. The lessons of giving and sharing remained with him throughout his life, Wirthlin Jr. said. "He believed in hard work and that there was 'no free lunch.' He told us to be careful what we spent and living within our means, but he was always generous to others." He maintained that same attitude during his career in the family business, even as he served as an LDS bishop and then stake president in the Bonneville Stake on the east side of Salt Lake City. Then one day in 1975, he got a phone call from church headquarters. When he returned to the office he shared with Wirthlin Jr., his son noticed something unusual in his father's demeanor. Wirthlin had been called to full-time service with the LDS Church, as assistant to the Quorum of Twelve Apostles. "Our life has changed," he told his son matter-of-factly. Family man: Wirthlin met his future wife, Elisa Young Rogers, when he arrived for a date with her older sister. In a flash, he knew Elisa, a 5-foot-6 blond , blue-eyed beauty who opened the door, was the one for him. He had seen her in a vision while on his mission in Austria. The two were married in 1941, after he had completed a business degree at the U. The couple maintained their love affair through 65 years, raising seven daughters and one son, and loving 59 grandchildren and 80-something great-grandchildren. "They would look at each other and start to laugh," Wirthlin Jr. said. "You could see their love and interdependence." The day Elisa Wirthlin died in August 2006 "was the most difficult day of Dad's life," the son said. Though extremely busy with his responsibilities as an apostle, Wirthlin was an involved father and grandfather. "He never missed a single father-and-sons outing," Wirthlin Jr. recalled Tuesday. "There was not a day of life -- unless he was out of the country -- when I didn't talk to him." That commitment to family remained strong throughout Wirthlin's three decades of service as an LDS apostle. After 18 months as an assistant, he became a member of the First Quorum of Seventy where he served the church first as an area supervisor in Europe, then in the Southwest and the Caribbean, then in Brazil and finally, back to Europe. In 1986, Wirthlin was named an apostle and became the first chairman of the church's new Humanitarian Service Committee, overseeing its global relief efforts. In 2001, Brigham Young University gave him an honorary doctorate for Christian service. Those assignments "accentuated his natural empathy and compassion," Wirthlin Jr. said. "He saw firsthand that life is not always easy, but his constant message was to pick yourself up ®and carry on. Never quit."